Primary snoring (PS) is one of the sleep breathing disorders with suboptimal results of treatment. It is recommended that Oropharyngeal exercises can be a therapeutic choice for the patients with mild to moderate degrees of PS. 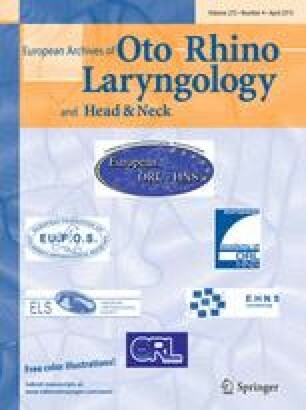 We assessed the effects of oropharyngeal–lingual (OPL) exercises on patients with primary snoring (PS) referred to Amiralmomenin University Hospital, Rasht, Iran in 2012. Fifty-three patients with PS underwent the sets of OPL exercises for 3 months, 5 days a week, and 30 min a day under the supervision of a speech therapist. Severity of the snoring was assessed by use of Visual Analogue Scale (VAS) and Snoring Scale Score (SSS) criteria before and after the exercises, and data were analyzed using SPSS version 17. Mean SSS before the study was 7.01 ± 1.72, while it was 3.09 ± 2.7 after the study; and the mean VAS scores were 8.54 ± 1.89 and 4.69 ± 2.94 before and after the study, respectively (P = 0.0001). There was a significant relationship between having conflicts with roommates (P = 0.0001), duration of snoring occurrence (P = 0.0001), severity of snoring (P = 0.0001) before and after the intervention. In conclusion, doing the OPL exercises significantly decreases the severity of PS. None of the researchers had conflict of interest during this study.